An MH Plug serves as a "carrier" in a high pressure access system, and is used to install and hold a device in an MH Access Fitting. The device is mounted on the plug, and is then inserted into the Access Fitting using the Retrieval Tool. 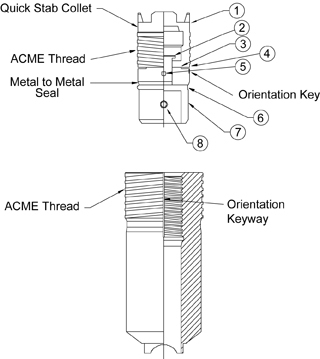 The plug holds the device in place during service, and serves as the primary pressure boundary. The MH plug assemblies incorporate the following innovative design features which distinguish them from the HP plug assemblies and plug assemblies available from other major manufacturers. A quick stab collet to facilitate easy attachment to the retrieval tool during removal and installation of the plug. 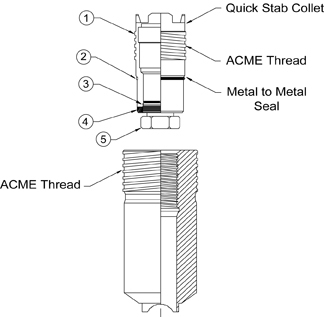 A coarse ACME plug thread to minimize the risk of galling or plug fouling. A keyway feature to permit reproducible accurate orientation of installed hardware, coupon equipment, and injection nozzles. A metal-to-metal back-up seal to minimize leakage, even if the access fitting assembly is subjected to high temperatures.